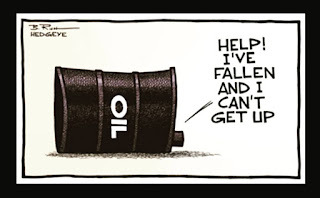 TECHNOLOGY AND OIL MARKET: Another False Oil Price Rally: Crossing A Boundary. Another False Oil Price Rally: Crossing A Boundary. From Art Berman at @Forbes -- The oil-price rally that began in mid-February will almost certainly collapse. It is similar to the false March-June 2015 rally. In both cases, prices increased largely because of sentiment. As in the earlier rally, current storage volumes are too large and demand is too weak to sustain higher prices for long. WTI prices have increased 47% over the past 20 days from $26.2 in mid-February to $38.5 last week. A year ago, WTI rose 41% in 35 days from $43 to almost $61. Like today, analysts then believed that a bottom had been reached. Prices stayed around $60 for 37 days before falling to a new bottom of $38 in late August. Much lower bottoms would be found after that all the way to $26 at the beginning of the present rally. Higher prices were unsustainable a year ago partly because crude oil inventories were more than 100 mmb (million barrels) above the 5-year average. Current inventory levels are 50 mmb higher than during the false rally of 2015 and are they still increasing. International stocks reflect a similar picture. OECD inventories are at 3.1 billion barrels of liquids, 431 mmb more than the 2010-2014 average and 359 mmb above the 2015 level. Approximately one-third of OECD stocks are US (1.35 billion barrels of liquids). For 2015, US liquids consumption shows a negative correlation with crude oil storage volumes. During the 2015 false price rally, consumption began to increase in April and May following the lowest WTI oil prices since March 2009–response lags cause often by several months. Q12015 prices averaged $47.54 compared to an average price of more than $99 from November 2010 through September 2014. This coincided with the onset of declining U.S. crude oil production after April 2015. Net withdrawals from storage continued until consumption fell in July in response to higher oil prices that climbed to $60 in June. Production increased because of higher prices from July through November before resuming its decline after prices fell again, this time, far below previous lows. This sequence of responses shows how sensitive the current market is to small changes.